This is the latest installment of “After Hours” — a series about faculty and staff who balance their work lives with side projects or fascinating hobbies. 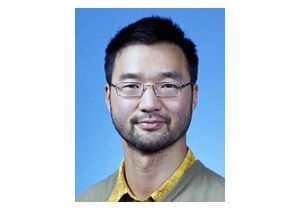 Day job: Chwe, which is pronounced like "chess" without the "ss," is a professor of political science who teaches game theory, which is essentially the study of how people make choices in anticipation of the actions of other people. Earlier this year he made headlines for his book “Jane Austen, Game Theorist,” in which he detailed game theory strategies in the works of the 19th-century English novelist. 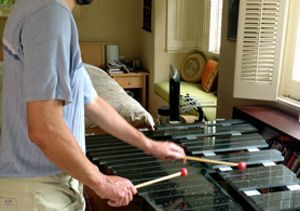 Political science professor Michael Chwe plays the lithophone, a xylophone-like instrument that uses stones as the keys, that he made at home. After hours: He makes lithophones (in Greek lithos means “rock” and phone means “voice” or “sound”), an ancient xylophone-like instrument with keys that are made from rocks and struck to produce musical tones. In some caves throughout the world, there are naturally occurring lithophones made of stalactites. A musical background: Growing up in Alabama, Chwe played the violin. As an undergrad at Caltech he sang in the glee club, and in graduate school at Northwestern he played fiddle in an old-time folk music group. 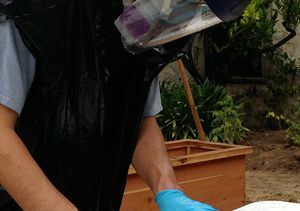 How he got started actually building one: Chwe learned how to make a lithophone by reading Bart Hopkin's book, “Musical Instrument Design,” and from talking with his son Hanyu's percussion teacher, UCLA graduate Aaron Smith. He first tried using slate, as in the Sigur Ros documentary. However, the slate pieces were very difficult to tune to a specific note, Chwe said, because the commercially available slate pieces aren’t of a uniform thickness. They’re typically used for outdoor walking paths not floors, which require more even flatness. He then decided to use pre-cut granite tiles made for flooring, which are more uniform and easier to cut precisely. You can buy everything you need at the store: Chwe said he spent about $200 on some granite tile at a store in Santa Monica and $100 for a tile saw at a hardware store. The saw, he said, is “exactly what you get if you’re laying a granite floor in your house.” Chwe said describing the saw. After using granite, he tried using marble, but he found that marble doesn’t work well because pieces flake off rather than smoothly grind down. Not afraid of power tools: Chwe said that he grew up with a father who loved to tinker. Chwe’s dad even tried building his own violins from old, broken ones and once tried to make an electro-static air cleaner that removed dust by circulating air over electrically charged plates. That didn’t work so well, Chwe recalled. “It started glowing so we unplugged it quickly and that was it.” But Chwe’s father’s mostly successful efforts found him regularly doing body work on the family car, fixing the plumbing under the sink and building furniture for the house. “Dad said, ‘if you call somebody to repair your house just watch them and you can learn to do it yourself,’” said Chwe, who built the bookshelves in his house. Safety first. To prevent bits of rock and dust from getting into his mouth and eyes Chwe wears protective gear as he slices the stone tile. The process: Chwe starts by using the tile saw, which really acts as a grinder. A standard granite tile is a 12-inch square, and the first step is to cut the square into five rectangular bars, each 2-by-12 inches. Then the length of each bar is adjusted to tune it to the desired pitch. The saw Chwe uses allows him to shave off increments smaller than a millimeter, which is important when trying to tune because there are no guidelines with exact measurements for a given pitch. The stone tile slabs Chwe buys can have minute variations in thickness, so while a four-inch long bar from one slab might sound the note G, from another slab it might be an F. Once he has the bars completed he simply places them in the standard piano arrangement on a tabletop or other stand. Success leads to unexpected fame: After two weeks of spending a couple of hours a day, he completed his first 4.3-octave lithophone, which sits in his bedroom, and put up a webpage describing its construction. He has since made three more — one that was auctioned off at a fundraiser at his son’s high school and the other two in response to an email request he received last February from a man in France. Frederic Daumas said he needed them for a performance by the Orchestra National de Lyon of a piano concerto written by Korean composer Un Suk Chin, which requires the obscure stone instrument. Daumas, co-owner of the percussion rental firm Daumas Percussion, told Chwe that he discovered his instrument by searching for lithophones on the internet.